This is an update to my 'Google' post. 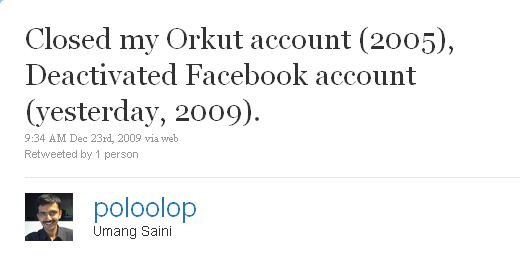 I deactivated my Facebook account last year in favor of @poloolop now Buzz. The dashboard now shows 41 of these. The other 12 being either stand alone applications or currently in Labs (Chrome, Earth, Toolbar, Trends etc.). In the one year since, I've added 6500+ search queries (~20 queries per day). Overall average being 10.5 queries per day in 1860 days since Web History started recording this data. News - NYT / NDTV / NewScientist etc. All my shared items are split (repeated) between Buzz, Reader, Friendfeed and Twitter. All these links available on my Google profiles page. p.s. I am also registered at countless other websites, but usage is substantially less.